Fosjoas holds the balance in intelligent self-balancing scooters market and its products occupy a very big market share. However, it doesn't mean Fosjoas is satisfied with the existing state. 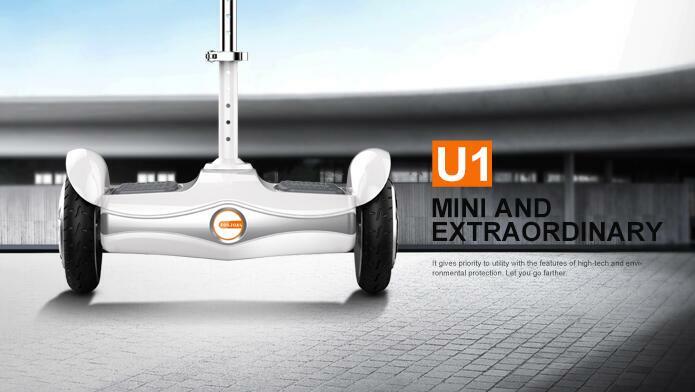 In order to give the mass consumers the best travel, Fosjoas has released a brand-new scooter type: U1 mini self-balancing scooter. Briefly speaking, it is the perfect integration of comfort, safety and happiness. The following will tell why. According to its name, Fosjoas U1 mini self-balancing scooter is small in size and light in weight, which paves the way for good flexibility. Meanwhile, Fosjoas R&D team broke the tradition boldly and made U1 be equipped with standing-posture and sitting-posture riding modes at the same time. The double riding modes are realized by an adjustable saddle. If users want to stand to ride Fosjoas U1, they can press the saddle down. And yet if they want to sit, they can adjust the saddle at the suitable height. Besides comfortable riding postures, Fosjoas U1 also offers comfortable riding experience. It takes very little physical strength to ride Fosjoas U1, which mainly benefits from adopted aerospace attitude control theory, fuzzy software algorithm and gyroscope system. Then, slightly leaning forward means moving forward, while leaning backward means slowing down. It seems as Fosjoas U1 has its own thoughts and helps riders to realize various controls. People will be happy if they select Fosjoas U1 two wheel electric scooter, because it helps them a lot in daily life. They can play Fosjoas U1 with their kids in park so as to enhance the parents-kids bonding. The elderly can ride it to take part in morning exercise or to buy foods in supermarket. Girls can ride it to walk dog. All in all, Fosjoas U1 electric scooter makes life much more wonderful and happier. It is really an all-rounder.